Papain is an active enzyme found in the natural papaya leaf. Papain is typically combined with two other proteases in oral enzyme therapy. The clinical study referenced below shows a significant positive difference in the survival rate for patients taking papain. Additional cases were reviewed naming less suffering and more survival when oral enzyme therapy that included papain was used as a complement to chemotherapy and radiation. Papain is the main enzyme in the papaya leaf. Kotra Pharma markets a drug called Axcel Papain for inflammation and edema. Scientists have discovered that papaya leaf tea stimulates macrophages, the “big eaters” in your body. The function of macrophages is one key to battling auto-immune disease. 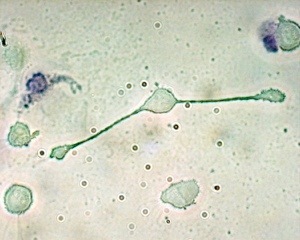 The reason is that macrophages clean up waste in your body including poisons, pathogens, and, of course, cancer cells. Papaya Leaf tea can be taken as a form of enzyme therapy. Proteases (protein dissolving enzymes) continue to show effect against cancers in the lab. Dr Beard, the Scottish embryologist, showed the effect of trypsin (similar to our body’s natural protease) taken from a young calf on human cancerous tumors. The enzyme “ignites” activity in the human body. In Dr Beard’s studies, trypsin injected directly into cancerous tumors appeared to slow down or stop tumor growth. Why would we need more proteases in our body if it already produces trypsin? Dr Howell, the famous enzyme scientist, addressed that question by the analogy of our bodies having an enzyme “bank” that becomes depleted as we age and when we consume cooked food. The idea is that cooked food does not contain necessary digestive enzymes, so the body essentially must borrow from the “bank”. When the bank becomes depleted of proteases from digesting cooked food it has less ability to use these enzymes for healing. Additional factors create an environment for cancerous, non-differentiated cells to grow. A Key to changing toxic, low oxygen cellular environments is to give your body the digestive enzymes necessary to function food digestion and remove toxic waste as it builds up in the blood. Enzyme therapy contributes to this goal. Papaya leaf tea has a very unique set of proteases in nature called papain and chymopapain. These proteolytic enzymes are more powerful than your body’s trypsin. Papaya leaf tea can be a form of enzyme therapy if taken on a regular basis and for a minimum of three months.